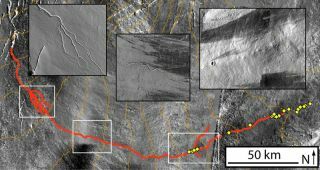 Details from the Ascraeus channel (red), meandering across the surface of Mars. The insets in the black boxes show close-ups of some of the structures that lava can form: (left) branched channels, (middle) a snaking channel and (right) rootless vents; the rootless vents are also marked by yellow spots on the main image. Didflowing water carve the well-known channels on the face of Mars? Or was moltenlava perhaps the instigator? This debate has raged for years, and the answer isimportant, because if there was a lot of surface water, that increases thechances that life may once have existed. Comparisonof images of Martian channels to lava flows in Hawaii indicates that lava, notwater, may have been the creative force behind at least some of the channels.So said NASA researcher Jacob Bleacher, speaking before the 41st Lunar andPlanetary Science Conference last week. "Tounderstand if life ? as we know it ? ever existed on Mars, we need tounderstand where water is or was," Bleacher said. Thenotion that water once flowed freely on Mars derives from images showingdetails resembling fluvial(water-based) erosion. Fine, delicate terrain features usually aren'tconsidered products that lava flows can create. "Thecommon image [of lava] is of the big, open channels in Hawaii," Bleacherexplains. Asingle channel on the southwest flank of Mars' Ascraeus Mons volcano, one ofthree volcanoes collectively known as the Tharsis Montes, formed the basis ofBleacher and his colleagues' research. The team pieced together images coveringmore than 168 miles (270 kilometers) of this channel utilizing high-resolutionpictures from three cameras: the Thermal Emission Imaging System (THEMIS) onboard Mars Odyssey spacecraft, the Context Imager (CTX) on Mars ReconnaissanceOrbiter and the High/Super Resolution Stereo Color (HRSC) imager on MarsExpress, as well as older data from the Mars Orbiter Laser Altimeter (MOLA)on Mars Global Surveyor (MGS). Thesedata gave a more detailed view of the surface than previously available. Timehas obliterated the fluid that created the Ascraeus Mons channels, but visualclues at the source of the channel in question seem to indicate that water isthe culprit. Clues include small islands, secondary channels that branch offand rejoin the main one and eroded bars on the insides of the curves of thechannels. But newclose examination of the channel's other end by Bleacher and colleaguesrevealed a ridge that appears to have lava flows coming out of it. In someareas, "the channel is actually roofed over, as if it were a lava tube,and lined up along this, we see several rootless vents," or openings wherelava is forced out of the tube and creates small structures, he explained. Water-carvedchannels don't typically form these types of features, he notes. Bleacherargues that one end of the channel forming by water and the other end by lavais an "exotic" combination. More likely, he thinks, lava formed theentire channel. Tocompare the Mars features to those created by lava, Bleacher, along with W.Brent Garry and Jim Zimbelman at the Smithsonian Institution in Washington,examined the 32 mile (51-kilometer) lava flow from the 1859 eruption of MaunaLoa on the Big Island of Hawaii. They focused on a mid-channel island almost akilometer long. Bleacher says this is much larger than islands typicallyidentified within lava flows. Tosurvey the island, the team used differential GPS, which provides locationinformation to within about 1.1 to 1.9 inches (3 to 5 centimeters), more accuratethan a car's GPS can offer. "Wefound terraced walls on the insides of these channels, channels that go out andjust disappear, channels that cut back into the main one, and vertical walls 9meters (~29 feet) high," Bleacher said. "So, right here, in somethingthat we know was formed only by flowing lava, we found most of the featuresthat were considered to be diagnostic of water-carved channels on Mars." The newresults make "a strong case that fluid lava can produce channels that lookvery much like water-generated features," Zimbelman said. "So, weshould not jump to a water-related conclusion when we see such channels onother planets, particularly in volcanic terrain such as that around the TharsisMontes volcanoes." Further,researchers discovered more evidence from the moon by studying a detailed imageof channels in the Mare Imbrium, a large crater filled with ancient lava rock.In this image, as well, they found channels with terraced walls and branchingsecondary channels. Theconclusion that lava probably made the channel on Mars "not only hasimplications for the geological evolution of the Ascraeus Mons but also thewhole Tharsis Bulge [volcanic region]," said Andy de Wet, a co-author ofthe study at Franklin & Marshall College, Lancaster, Penn. "It mayalso have some implications for the supposed widespread involvement of water inthe geological evolution of Mars." Bleachernotes that the team's conclusions do not preclude the possibility of flowing wateron Mars, nor of other channels carved by water. "Butone thing I've learned is not to underestimate the way that liquid rock willflow," he said. "It really can produce a lot of things that we mightnot think it would."